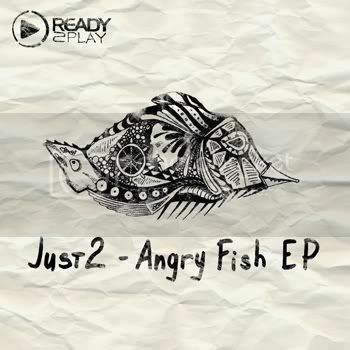 New release of the label "Ready2play". Amazing EP from Romanian project - JUST2 (Southpark Records,Potobolo Records). period of time which brought them valuable experience, they formed this project, after realising they share the same sound. with whom they hope to leave an impression everywhere they play. 2011 brings the two a tight schedule, but they should be followed throughout the year, as they will acomplish great things. Kid Shakers - Thanks !! Nice pack, Angry Fish and Bang The Gang for us! Dash Berli n (Armada / Aropa) - Great grooves, keep it for the private collection. Frank Frenzy (100.7 FM TorontoGlobalRadio) - Loving this bangin' E.P.! All 3 tracks are great and supporting! Sonic Union (Lowbit, Replug, Anjunadeep) -Сool groovy sounds. dPen (Hope Recs, STM) - Nice techies!! Bin Fackeen - Сool ep! Darko De Jan (CR2/Hotfingers/303Lovers/Nervous/Soda...) - Very good groove and all 3. Support! Smootrab - "Hello Darling" will be supported this saturday on the Rotationz Show on Belgian FM Radio TOPRADIO! Cristian Poow (Dbeatzion Records) - Good stuff! Matan Caspi (Spinnin', Pacha, Harem, UDR) - Great techy vibes. will support in my radio show. Catastrophic (Tunnel FM) - "Hello Darling" is my pick here! Nice one guys! Pena (Flow) - "Bang The Gang" and "Angry Fish" Have some cool grooves, dope. Ryan Sullivan (Gut Feel Rec, Triplefire Music, Baroque, Mistique) - High energy, large and groovy house music! Very good release. Will play out for sure. Mark Junior (Joia Records, 925 Digital, Hyline music, Neuroscience rec, Armad) - Nice tunes! David Javate (Killswitch San Francisco) - Solid tech house on the lines of Martinez & Mihai Popviciu...good stuff! Monojoke (Particles / Apollo / Fade / Olaris / Silk / Spring Tube / DSUK) - Like it much, thanks. Stefan DJordjevic (iface agency, UCM ) - Nice tech, thanks! Felipe Nadeau (DNW Records) - Excellent proposal, it follows a clear line with the Chicago House elements on vogue today. Angry Fish presents itself as a good intro, nice one to mix as too. Bang the gang goes up thinking i! n the dancefloor and Hello Darling definetly is the one more destined to move the bodies there. Congratulations to the label and the artist for this nice release.